How's the steam shower working? Are you glad you installed one? Can you use it with and without steam? The steam shower is awesome! It's probably my favorite room in the house. It takes about 5 minutes for steam to start and another 5-10 before it's good and hot in there. I use it at least twice a week and yes you can use the shower without the steam unit on. 1) Make sure you run some type of radiant or electric heating in the bench and walls where you will be sitting. Stone gets awfully cold in the winter so I spend 5 minutes warming the bench and walls up with hot water from the shower. Also, the steam shower will perform better if the walls are warm. 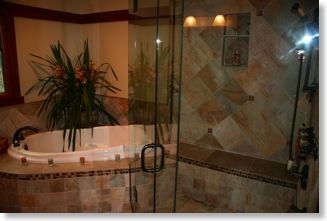 2) Do your best to position the shower so it is only on interior walls. If you must place the shower against an exterior wall as I did, try to put the bench on one of the interior walls, if there is one. 3) Your ceiling must have a slope. Most contractors do not know this unless they have installed a steam shower in the past. The slope is required to allow the water to run to a wall instead of dropping on your head. 4) Another thing contractors don't generally know is that fans are not allowed inside a steam shower like in a regular shower. The moisture is so great that a fan will rust out in no time.